From last time’s lecture, we have underlined that Poetry is a kind of imaginative language use. Poetry shapes language in a way that distinguishes itself from other forms of literature (primarily, all literary prose), and other means of communication. How does it do this? Poetry operates by way of condensed suggestion; it shows instead of tells. 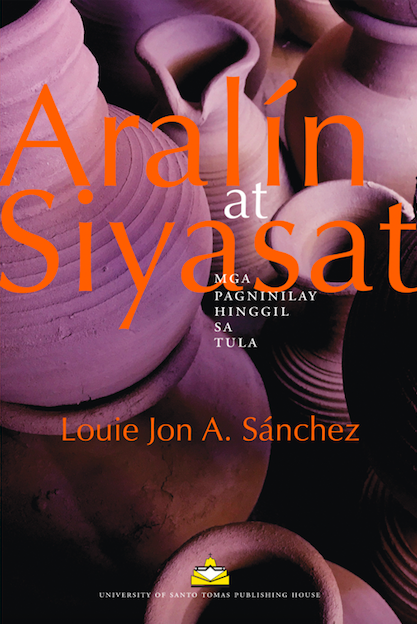 When the National Artist for Literature Edith Tiempo says that Poetry is “structured in metaphor,” she identifies this figure, metaphor, as the main element that enables poetic suggestion, and thus indirectness, which is not merely done for its own sake, but to awaken us from our automatic ways of thinking and perceiving. Metaphor transforms by way of the image. What we see in the image changes into something else, as metaphor essentially transports a thing’s qualities to another. The mystery of the comparison takes place when the image is fully made to embody the other, and ultimately becomes, and quite astonishingly, the other, while at the same time still sporting its same, old self. The most used up example is Shakespeare’s “All the world’s a stage, and all the men and women merely players” from As You Like It. The stage’s setting of performances is transferred to the world, where “all the men and women (are) merely players.” Life, in all its complexities, is all of a sudden being characterized as a performance of roles, a delivery of pre-ordained performances. The plane where this transformation, this metamorphosis takes place, is language, as language is made to make a turn from its usual, straightforward discourse and reinvent articulation to offer fresher insights into our experiences. Poetry’s swerving from our automatic means of making sense is best illustrated by a mastery of figurative language commonly used to evoke the vast potential senses of imagery. This swerving, also known in literature as tropes [etymologically “turns” or “conversions,” where, as M.H. Abrams in his A Glossary of Literary Terms would put it, “words and phrases are used in a way that effects conspicuous change in what we take to be their standard meaning”], reinvigorates language, and as they say of Poetry, makes it new. Recognizing this newness reawakens the senses and compels us to be very attentive to whatever newly-revealed meaning is being afforded us by the poem. I say being afforded because poetic revelation is never a finished experience. If we allow it, Poetry would linger in our minds for quite a while, or even for life, and we would not be able to completely mine its signification. There would always be something new to see. Figurative language provides form to Poetry’s turns of thought, and makes possible the conversion of meaning carried out by tropes. The schemes to be found in what we traditionally call figures of speech are not only meant to be identified and classified alone, as most of us have been reared to do in our past experiences of studying literature, but also to be unpacked as working, as indeed part of the poetic scheme of suggesting new ways of seeing. 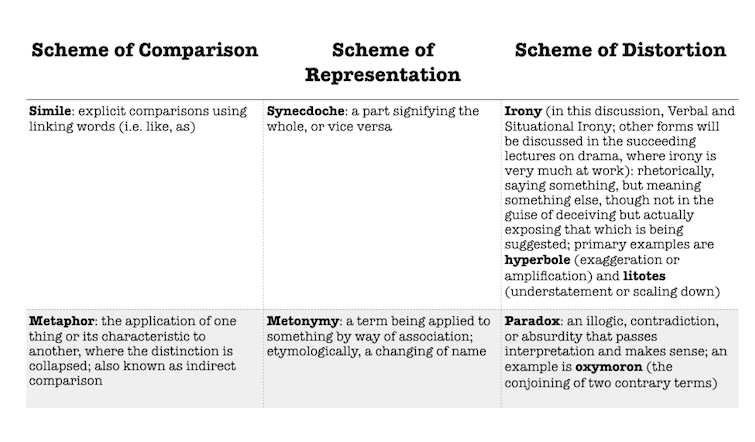 As far as I’m concerned, there are three main schemes of poetic conversion, rhetorically, that is linguistically being afforded us in Poetry: (1) the scheme of comparison, the most basic, where we also classify the two most familiar figures of speech, simile and metaphor; (2) the scheme of representation, exemplified by two other figures, synecdoche and metonymy; and (3) the scheme of distortion, which we may find in the figures of paradox and irony. Simile and metaphor are schemes that compare different things, though both carry out comparisons differently; similes explicitly compare using “like” or “as,” to name a few, while metaphors, on the other hand collapse the comparison by immediately, though deftly, applying one thing or its quality to another, in such a way that the comparison works by implication. Meanwhile, synecdoche and metonymy organic represent, that is, serve as stand ins for something else—still a matter of transformation; synecdoche is known to use parts to represent the whole [and vice versa], while metonymy works by replacing one thing with a name or term that is closely associated with it, as understood by a particular meaning-making community. Paradox and irony depart from and unsettle literal meanings by proposing opposition and disjunction, respectively. Paradox offers ideas that are quite contradictory and absurd, yet creates something logical and astounding out of them; irony, meanwhile, states or presents an idea or situation but actually means its opposite; some describe this as expressing something contrary to the truth. All, as we can see from our working definitions, strive to transform language, and consequently, meaning. Encountering them may startle us, make us think, and figure out why and how the transformation had to be carried out. Whatever the intended effect, figurative language intends to awaken us and also speaks of a human tendency, given the limitations of our own understanding. We always aspire and attempt to make sense of experience, but generally run out of concrete means of expression. Words easily fail us. Language is always an approximation of thought and may not always be reliable to bear all we want to mean. Comparisons, and ultimately, these figurative transformations, enable us to find a way to negotiate imprecision by helping us liken our most significant ideas and experiences to the more palpable world. Representations alert us to associations and relations, compartmentalizing the vastness of our experiences, and making us grasp their largeness by way of small things. Distortions on the other hand expand our expression, pushing language and statement to the limits, and reiterating that imagination is never, ever a straight, predictable path. Below is a comprehensive visual illustration of the said schemes and some of their subsequent permutations. Brief definitions are also given to further clarify distinctions. However, the one who is in power is ordained to play god, and this poem, which as I have said addresses Bonificio, becomes ultimately, Aguinaldo’s own self-address, as he uses Bonifacio to stand in as a sounding board for his own self-dialogue. A metaphor, which collapses comparison and illustrates how one becomes another, is composed of two parts, according to I. A. Richards: the tenor and the vehicle. The tenor is the subject of the comparison, while the vehicle is referred to as the metaphorical term. The tenor is a thing, idea, or person being referred and the vehicle manifests the comparison. The images mentioned above offer three metaphors that show Aguinaldo’s moment of reckoning: “lonely room/ of my conscience”; “darkness/ of my soul”; and “and heard my thoughts pace/ the long lightless corridors of the night.” The first one, that of Aguinaldo’s conscience (the tenor), is being likened to a lonely room (vehicle), and may conjure, not only the lonesome experience of making this difficult choice of liquidating his government’s potential political opposition, but also the historical isolation he will be receiving after the fact. This is also something that may be read in the “darkness/ of my soul,” where the soul (the tenor) is characterized as shrouded in darkness (the vehicle), and is quite hard to actually peer into when choices have to be made. 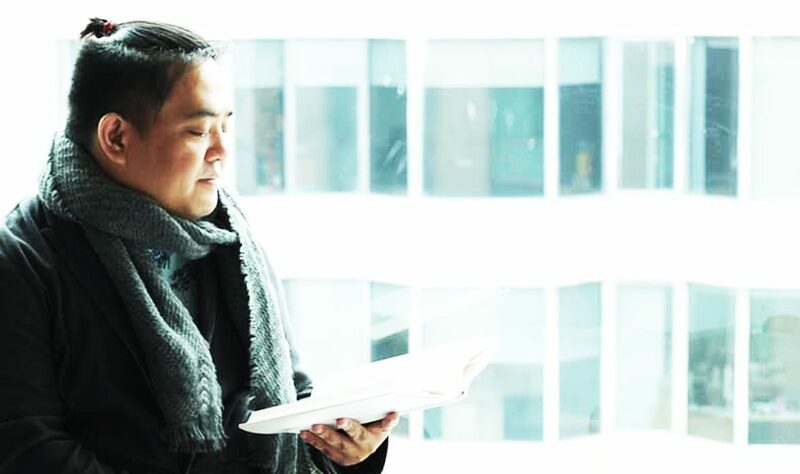 We see the use of personification in the lines “and heard my thoughts pace/ the long lightless corridors of the night,” and we understand how restless Aguinaldo’s soul had become, at least in this imagined monologue by the poet. The “long lightless corridors (vehicle) of the night (tenor)“ is a metaphor that serves as a rejoinder that further characterizes not only this fictionalized Aguinaldo, but also his historical dilemma on that eve of the execution. When he says to Bonifacio the stand in: “And (I) found the only answer you would have wished./ Were I in your place, I would ask for nothing less,” we may infer that he was simply comforting himself with the fact that he had decided as the situation demands. Was he trying to do a Pontius Pilate in this imagined moment, washing the blood from his hands? Yes. Quite an interesting speculation about this historical incident. Bonifacio’s execution has long been debated by historians as murder of the first order, but in this poem, a humanized Aguinaldo, full of conflicted ideas about sacrifices and heroisms, is presented, as if he is in his own court martial or trial, where he is alone being judged by a jury composed of God (or history), the Supremo whose death sentence is moot and academic, and himself. When he says: “I send you to a hero’s death while I shall remain/ a footnote in history, my name shrouded in gross/ speculations,” he sounds very noble and exemplary in humility. He sounds very willing to be a mere “footnote in history” just to stay true to the common dream of “(o)ne unfurling/ under the sky.” He seems very convinced of his own reasoning, but not quite, considering his past self-reiterations of “what needs to be done has to be done.” “Not that I love you any less, you must/ believe that,” he tells Bonifacio the stand in, who deflects the words and brings them back to the teller. You must/believe that. Indeed, a tragedy in false humility. Does Aguinaldo, as inhabited by our persona, actually believe in what he is trying to say? Was he successful in his self-argument? In the poem, he keeps on telling Bonifacio, in the eve of his execution, that he “should understand this,” and that his death, in Aguinaldo’s hands as main executioner, is something he himself would have wished to keep the new nation intact. But this is, of course, Aguinaldo’s editorializing, since he, as said, was rationalizing his decision in the midst of being afflicted by guilty conscience. He tells of how reasonable and well-meaning his decision is, and appears to be quite convinced himself. 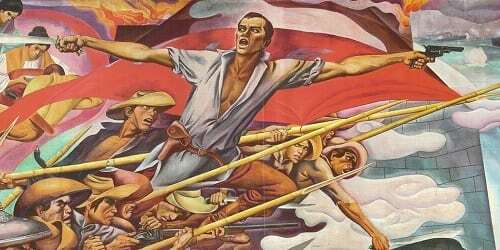 His words however betray him, and as he utters, “I send you to a hero’s death while I shall remain/ a footnote in history, my name shrouded in gross/ speculations,” we hear the voice of this Aguinaldo’s own covetousness, his own desire to possess the heroism he is about to give away. All statements expressed by him in the poem fall into utter irony, where the opposite, that is, contempt of everything about Bonifacio, is actually implied. In the line, “Isn’t that your dream, too, worthy of the supreme/ sacrifice?” he does not praise Bonifacio but mock him, since his life was in his hands, and he had more to lose than gain with him around. One only takes the supreme sacrifice as needed; it is not something one prescribes. Aguinaldo the persona considers his taking the reins of power, and the decision to execute the Bonifacio brothers, as sacrifice, and conflates them with the “sacrifice” he was expecting the Supremo to take wholeheartedly as a price to pay for the unity of the emerging Filipino nation. He has, as I have already said, silenced him and imposed his own way of seeing things. For Aguinaldo, both of them are sharing a “common sacrifice,” and the least that he could do is to wish Bonifacio peace as he “meets (his) destiny”: “So go in peace and meet your destiny, my brother,/ for all our sake even as the night bleeds into morning.” It was a destiny that history has been arguing as one that Aguinaldo imposed. He sends him away, to oblivion, but does not get his wish, as historians would have it: “Go, Andres. Let the healing begin.” In the poem, Aguinaldo the persona foretold how history would regard him, as “a footnote in history, my name shrouded in gross/ speculations.” The tone of the poem is very ironic [sarcastic, actually], and provides a compelling tension that lends humanity to these otherwise cold historical figures we occasionally appreciate [that is, literally, during occasions commemorating them]. There’s irony too, in the silence of Bonifacio here, since his figurative opposition gave voice to the fictionalized Aguinaldo’s speculated political, and even personal insecurity. Aguinaldo’s only means to slay the shadow of the Bonifacio was to execute him, get him out of the way. The poem does not only illustrate its historical conjectures by way of simile, metaphor, synecdoche, and metonymy, but also of irony, where the unsaid, the opposite, is revealed. While the poem is indeed a dialogue on the eve of the execution, it is mostly directed to Aguinaldo’s self, who is considered by many as perpetually and historically haunted by Bonifacio’s execution. No healing had really began after the Bonifacio brothers were killed in the mountains of Maragondon, Cavite. Until now, historians are still arguing whether Bonifacio is indeed the rightful individual to be considered the first Philippine president. Many still find Aguinaldo a contentious figure in Philippine history, and even a symbol of a leadership culture that reeks of regionalism or parochialism. Is healing possible, as wished by this version of Aguinaldo in poetry? Perhaps. The project of the nation is always a work in progress. To heal, in this Aguinaldo’s perception, is basically to unify. To a country as divided then and now, there are choices that need to be made. But when are the persecution and murder of opposition ever justifiable? I’ll leave this question as food for thought, as we continue to consider and weigh our love for this country. The poem does not only illustrate its historical conjectures by way of simile, metaphor, synecdoche, and metonymy, but also of irony, where the unsaid, the opposite, is revealed. While the poem is indeed a dialogue on the eve of the execution, it is mostly directed to Aguinaldo’s self, who is considered by many as perpetually and historically haunted by Bonifacio’s execution. From love of country, we move on to more familiar territory, the territory of the self and all the other things we love, as we examine the figures present in the poem “Finder Loser” by Ophelia A. Dimalanta. As it is a play on our usual notions of “finders, keepers,” we encounter in the title a paradoxical contemplation of a persona about life as precisely consisting of, and being summed up by these two proverbial experiences. The title actually offers an oxymoron, an instance of paradox where contradictory terms are put together to evoke a concealed meaning. For indeed, how can one finder become a loser all at the same time? The poem’s persona makes sense of it by way of life’s very paradox. In the first stanza, the persona articulates how the acts of finding and losing primarily compose his/her life: “more than half of my life/ i spend searching for lost/ objects (papers, receipts,/ old letters, pills, and whatever/ else) and causes and the rest, losing and finding, and losing/ them again, found or otherwise; losing what i have and in good/ measure, finding what/ i can’t almost have—/ one perpetual lifetime probe,/ forever rummaging through/ bureaus and drawers and pages/ of my life’s past disarray.” The first few lines contain an ironic illustration, by way of understatement or litotes, which basically operates by scaling down; life, in its vastness, is understood as a matter between the experiences of finding and losing. Of course, we know that life is definitely larger that these two opposing poles, but the persona persists in proposing this way of seeing life as “one perpetual lifetime probe” and offering as additional metaphor for living, this “forever rummaging through/ bureaus and drawers and pages/ of my life’s past disarray.” One’s life is only to be understood in hindsight, and this properly explains why the persona needs the figures [or vehicles] of the “bureaus and drawers and pages” to be able to make sense of “life’s past disarray.” The “rummaging” however will take forever, and no matter how one neatly attempts safe keeping through the vehicles of the persona’s metaphor, there are no guarantees that generally, the search, as well as the losses would end. Is the poem suggesting that life is a cycle of desiring that comes with consequent frustrations? Perhaps. And this also motivates the persona to pursue the said ironic compression of the nature of life. Both finding and losing are found to be profound enough to characterize what it is! The persona does not tell us exactly what he/she is finding or losing, but finds comfort in the fact that to find is to lose, and to lose is also to find. This is what may be perceived in the second stanza, where the persona makes some form of an implied wish, if and when he/she dies: “and so when i finally go,/ keep the vault unliddled, for i/ shall surely sit up and look/ around to pursue this search,/ holding on to dear life,/ or dear death, does it matter—/they are one in the proper/ time but not till then.” How can death and life be one, “in the proper/ time”? Another paradox is offered to us, this time, one that blurs the difference between the two particular poles that truncate human life. Pursuing the logic of this paradox, we may begin by considering life and in its myriad searches and losses, as also ways of dying, of burying old selves and resurrecting new selves that are more primed to live in fullness. Death does not just come literally, and yes, “in the proper/ time” as the persona puts it; in living however, we experience deaths that are formative [and yes, also destructive] to our personhood. For instance, something somehow dies in us when we experience big and small losses. Certainly, we are also able recoup and recover something in these, we discover our selves anew, which makes losses all the more as worthy to be embraced. This is perhaps the reason why the persona, even in anticipated death, intends to go on finding and losing. Finding and losing are perceived to be all the same, whether or not one is already on that side of the life. It is a gift that keeps on giving. The persona assures him/herself, as well as his/her implied addressee the following: “i shall go on seeking out/ lost faces and faiths in the/ cold, collecting, calculating/ crowd, sadly aware that later/ but an unbreath away,/ i shall lose them all again,/ as i was wont, losing all/ in this final irretrievable/ loss of my deathtime.” There is fierceness, as well as self-assurance on the part of the persona, whom we may infer as a one who lives life fully. Not even death, which is the ultimate manifestation of loss, could deter him/her from his/her lifelong search. Despite a keen awareness of mortality and acceptance of loss’s unrelenting presence, he/she allows that seemingly only abiding life force that brings meaning to life—that of the search, for knowledge perhaps, for happiness, or even for enlightenment. Her unconventional view of the afterlife [usually perceived as a realm of the uncertain, despite Catholic catechisms about its being life eternal] lends her the capacity to bravely see its possibilities; in his/her mind, he/she will go on finding and losing, and she even anticipates the “final irretrievable/ loss of (his/her) deathtime.” This, in my reading, is also his/her way of undermining the finality of death. He/she extends life’s search in the afterlife, where his/her thirst for the things longed for would never ever be quenched. And this, even when the price to pay is death itself, that final repose and rest that may provide the persona the reprieve from all the search he/she been engaging all his/her life. He/she is willing to let of that reprieve! There’s just no resting for this persona. The line “final irretrievable/ loss of my death time” is another instance of irony, this time, in the form of hyperbole or exaggeration, which, as I have earlier explained, works by magnifying or amplifying the sense being offered by a statement. How could one’s death time be rendered irretrievable and possibly become part of everything one could lose? The reading I have offered suggests the logic of this irony, since this persona’s quest to search and find overcomes both life and death. In the last few lines, the persona also entertains the possibility that death would be more tolerant, and not as stern as expected—an interesting personification, if you ask me: “or perhaps, possibly yes,/ death will be kinder and oh, yes/ allow me at last this/ flowing final find.” In the end, the persona reveals that which he/she longs for, in life, and even in death: that flowing final find, a musical assemblage of words, alliterating to conjure the discovery, not of eternal youth, but of eternal longing and search, which flows in finality and is final in an asserted flow. Does the finding ever end? The answer is of course, no. Which makes the statement another instance of oxymoron, as it paradoxically combines both flow and finality to modify the word “find,” and which in the first place is never complete, in this poem, if unaccompanied by its oppositional term “lose.” In his/her search for the essence of life, the persona finds him/herself lost in all his/her longings, wishes, dreams, or desires, loses him/herself in the process, and understands in the end that this will go on, till kingdom come. Is this a bad thing or not? It depends on the way one sees it. Any search after all is an attempt to possess, to have, and the judgment on attachments may be easily passed given the circumstances. The persona however is talking in the abstract, is apparently dealing with abstract life searches, which makes life “one perpetual lifetime probe.” The persona’s only wish, I suppose, is that even death itself comes to terms with human nature: that it may grant him/her this “flowing final find,” where the end is paradoxically circumvented by the steady life force that is human persistence. It is, in itself, a wish, which coasts along the vicinity of finding, but despite the possibilities of loss, the desire for the flowing final find is hope enough to make this persona endure.